Providing you the best range of potassium salt of phophonic acid with effective & timely delivery. 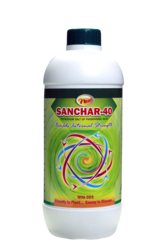 SANCHAR-40 is an aqueous formulation containing Potassium Phosphite as an active ingredient. This compound is also known as Potassium Salt of Phosphonic acid. The P2O5 content of this formulation is 16% minimum, the molecular formula of Phosphonic acid is H3PO3.Whereas it is H3PO4 for Phophoricacid. One oxygen molecule being less in Phophonicacid, makes it more active in the plant system. Mycorrhizal development, accelerating foliar uptake of other cations such as Calcium, Magnesium, & most microelements. It eradicates organism causing Downy mildew and Phytophthora in the plant System. It can be used as bio-stimulant to develop internal resistance against Oomycetes fungi. A product having systemic action working as a disease suppresor with protective & curative actions. Very popular on Grapes,effective on Cotton, Soyabean, Fruits &Vegetables also. Based on an inorganic source of plant nutrients & well suited for foliar application & soil drench. 600 ml / acre after pruning when buds have spouted. Citrus: –	20 to 30 ml/ plant – pre/post monsoon. Coconut: –	3 ml .Liter, pre/post monsoon. Tomato / Potato :-	2 ml / Liter, high humidity & Low temperature conditions. Cotton / Soyabean:-	2 ml per Liter, high humidity & low temperature conditions. SANCHAR – 40 is compatible with commonly used fungicides. Do not use along with Inorganic Micronutrients &Calcium Fertilizers. Looking for BIO FUNGICIDE ?